When the first pitch is thrown at Lindsey Nelson Stadium in Knoxville on Feb. 16 for the Terps’ season-opening series against Tennessee, first-year head coach Rob Vaughn—named to the position in June—will officially begin to lead a new era of Maryland baseball. Vaughn isn’t the only staff member occupying a new position this year, though. Matt Swope will begin his first season as assistant coach and recruiting coordinator; Corey Muscara enters his first season as pitching coach after spending five years at St. John’s; Anthony Papio is no longer a student assistant coach, but assumed the role of a volunteer assistant coach after last season. 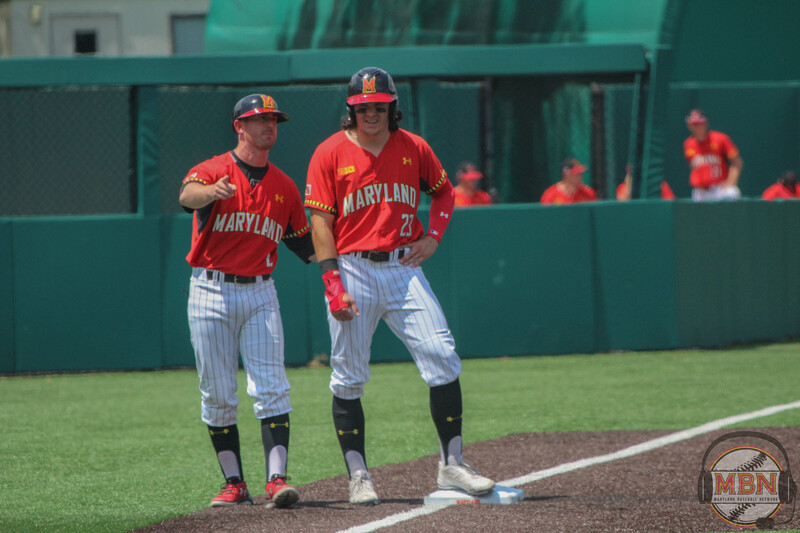 While their titles have changed since Maryland’s 2017 season came to an end in the NCAA Regionals, their prior experience in College Park suggests the program can pick up right where it left off. Vaughn, for instance, spent five years on staff in various assistant roles before being named the eighth head coach in program history this past summer. He helped secure Maryland’s best-ever recruiting class in 2016, and as the leader of the offense, coached the Terps to a top-35 finish in home runs (67) and stolen bases (101) in 2017. Vaughn, Swope and Papio were promoted from within the program, but it’s Muscara’s first year in College Park after helping lead the Red Storm to two NCAA Tournaments in five years. His pitching staff’s 3.11 ERA and 1.24 WHIP in 2017 were good for top-20 in the country. 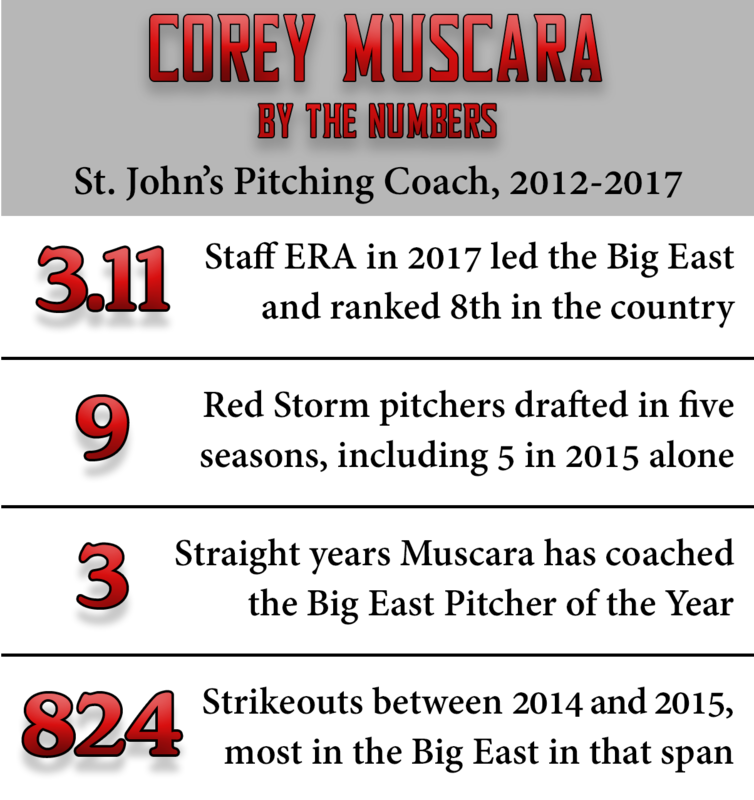 Pitching Coach Corey Muscara enters his first season at Maryland after a successful five-year stint at St. John’s University. One of Muscara’s biggest tasks in the offseason has been adjusting the Terps to life without right-hander Brian Shaffer, last year’s Big Ten Pitcher of the Year, who the Arizona Diamondbacks drafted in the sixth round of the 2017 MLB Draft. Even though Maryland will have to replace its successful Friday night starter, Vaughn is confident in the exposure his returning weekend pitchers—senior right-hander Taylor Bloom and sophomore left-hander Tyler Blohm—have seen on the college stage. Bloom pitched the Terps to an NCAA Regional Championship during his freshman season, allowing one hit and one earned run in 6.1 innings. As for Blohm, he was the Big Ten Freshman of the Year and a freshman All-American after winning eight games for the Terps last season. Junior right-hander Hunter Parsons, who has pitched 57.2 innings in two seasons, is expected to start on Sundays. Comprised mostly of upperclassmen, the Maryland lineup returns four of its top six bats from last season. Leading the offense will be junior Marty Costes, who crushed a team-leading 13 home runs last season, and he’ll be joined by veterans including senior center fielder Zach Jancarski and junior second baseman and preseason third-team All-American Nick Dunn. Junior AJ Lee, last year’s third baseman, will fill the gap in the middle of the infield left by shortstop Kevin Smith, who was drafted in the fourth round of last year’s MLB draft. Another pair of seniors returning to the Maryland lineup are catcher Justin Morris and first baseman Kevin Biondic. Morris came on strong in the postseason after taking over the full-time role behind the plate in early May. Biondic started 56 of 57 games as a sophomore, but took a backup role to infielder Brandon Gum last season. Even though Biondic received limited playing time in 2017, his work ethic, leadership and impressive offseason earned him a starting spot once again. So while coaching spots, positions in the field and nights starting on the mound were left empty at the start of the offseason, those voids were quickly filled with reassurance due to the extensive experience of coaches and players that took the place of their predecessors.